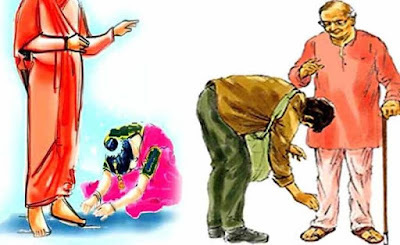 In Hindu rituals, it is found that people touch the feet. There are several ways such as hand joining and touching feet. However, touching feet is spiritual and scientific process. Touching feet in proper way gives wonderful benefit. This improves luck, avoids difficulty and gives feeling of god. Every person has special type of energy. It flows in hand and leg fingers. This energy transfer to each other by touch. A person absorbs the energy by touching feet through hand. In same way, if you keep hand on head then it absorbs energy. If the energy is auspicious then it gives immediate benefit. If you have faith for a person then touches the feet. If you touch the feet then touch the leg thumb with hand’s finger. If you bow on knee then keep your head in feet. Do sashtang only to your master or favored. When anyone touches the feet then keep your hand on the head. Daughter should not touch parents’ feet. Touching father’s feet avoid Sun related problem. Touching mother’s feet improves Moon. Mercury and Venus can be strengthened by touching women feet. Mars can be strengthened by touching siblings’ feet. Jupiter can be strengthened by touching old person’s feet. Shani and Rahu-Ketu can be controlled by touching pious, sinless and honest person’s feet. Every problem can be avoided by touching saint’s feet. This avoids problem of every planet. Good Luck: Leave home with happiness. This gives happiness during entire day. What Should You Do at Marriage Meeting?